Click here for the submission form to make your voice heard. The text in black is that of the official brochure (14MB!). In blue our comments. The New Zealand Underwater Association would like to thank the Project AWARE Foundation and the Department of Conservation for their assistance with this project. We would also like to acknowledge the help we have received from many groups, organisations and individuals in getting the Tiritiri Matangi marine reserve proposal to this stage. Tiritiri Matangi Island is one of New Zealand’s conservation treasures. Once farmland, the island has been replanted through the efforts of the local community. Rare and endangered native species have been returned to the island, including the little spotted kiwi, takahe and kokako. Seabirds such as penguins and petrels nest on the island. As well as being an important conservation sanctuary, Tiritiri Matangi is also an ‘open scientific reserve’. That means that the public are welcome to visit the island for recreation, education and research. The Whangaparaoa Peninsula is separated from Tiritiri Matangi Island by a 3 kilometre channel. Shakespear Regional Park, owned by the Auckland Regional Council, covers around three quarters of the end of the Peninsula, the remainder of the land being owned by the Navy. Shakespear Regional Park is open to the public and attracts more than 600,000 visitors each year. Tiritiri Matangi Island and Shakespear Regional Park are conservation areas. Plants and animals on the land are protected from damage - but below the tidal zone, marine species have no special protection. Why the difference? The ecological communities above and below the tidal zone overlap and interact. This is not recognised by reserves that end at the tidal mark. Protecting the marine area adjacent to land reserves provides a continuum of protection from the land to the sea. The belief that ecological communities above and below the tidal zone overlap is an often repeated myth. The boundary between sea and land is in fact quite sharp, with hardly any overlap, but where rivers enter the sea, a gradual overlap exists from fresh water to saltmarsh to salt estuary. Tiritiri being an island, does not have such an estuarine system. Although the intertidal area around Tiri is not protected in a strict sense, it could effectively be protected by placing a few signs. Our vision is a marine reserve protecting the habitats and species that live in the sea, seabed and foreshore around Tiritiri Matangi Island and Whangaparaoa Peninsula. Fish and marine life will benefit by having a refuge where they can live in safety. Protecting the marine environment will also help enhance the ecological value of the land reserves, by protecting the full range of biodiversity in the area. Both land and marine reserves will allow people to visit, study and enjoy a healthy environment. This is like saying that people do not enjoy Tiritiri at the moment. People have never been prevented from visiting, studying and enjoying the Tiritiri environment. But it is not a healthy environment, because it is threatened by landbased pollution and sewage. A marine reserve cannot redress these problems. It will not protect fish and marine life. The fish passing through the Tiri channel are mainly migratory, reason why fishing there is good. A marine reserve will not provide a refuge for them. Marine reserves are areas of the sea, seabed and foreshore where the marine habitat, plants and animals are preserved in a natural state for the scientific study of marine life. Marine reserves are open for the public to visit and enjoy. They provide opportunities for scientific study, education, recreation and conservation. Marine reserves are managed by the Department of Conservation under the Marine Reserves Act 1971. People have come to resent the Marine Reserves Act 1971 and the people who administer it, the Department of Conservation, because of their inflexibility and other good reasons. A marine reserve as proposed is an area rigidly closed off in perpetuity. Worse still, it does not give the management of this area to the local people. Instead, an ideologically-driven central bureacracy steps in to subdue people to its rigid rules, backed by draconian laws of enforcement. Marine reserves do not respect peoples right to fish for sustenance, which is a major issue for pensioners having moved here for a more natural way of life. There are better ways. A marine reserve will provide continuity to the land-based conservation of Tiritiri Matangi Island and Shakespear Regional Park. It will give the marine environment equivalent protection as is given to the habitats, plants and animals on the adjacent land. It will NOT because the main threats from land based pollution remain, growing worse as more people come to live in the area: more land development, roads and sewage. It all worsens the degradation of the underwater environment. Of course these threats do not affect the land. The marine area includes a wide range of habitat types, many of which are not protected in existing reserves in the Hauraki Gulf. It will therefore contribute to a representative network of marine protected areas both within the Gulf, and for New Zealand as a whole. There are coastal marine reserves at Tawharanui, Leigh and Long Bay. How can this place have habitat types not represented by the ones to the north and to the south? 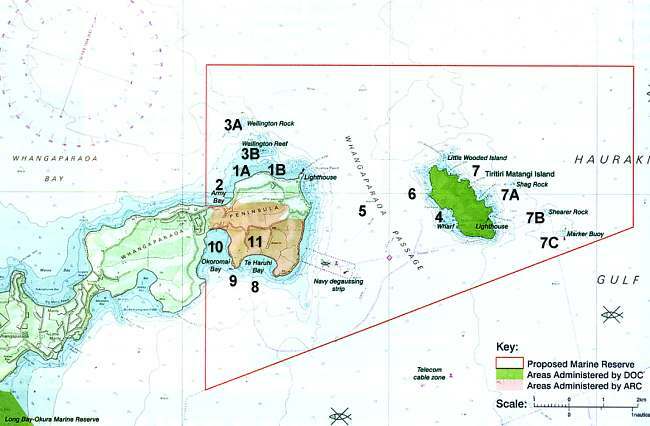 Long Bay marine reserve is only a few kilometres away, as shown in the bottom of the map. Tiritiri Matangi Island is an open scientific reserve and is already an important location for scientific research. A marine reserve would make the area more natural and undisturbed for existing scientific research, and provide new opportunities for marine research. The research done on Tiritiri is land-based, related to the rehabilitation of birds. A marine reserve would NOT make the area more natural and undisturbed, as the main disturbances will remain. If new opportunities for marine research are expected, then why is it not used as such now? Tiritiri Matangi Island and Shakespear Regional Park are important places for education. Hundreds of schools from the Auckland region and beyond visit these special places each year. A marine reserve would give children and adults the chance to learn about the marine environment in an undisturbed state. What schools need is an area of undisturbed rocky shore, which can be created and enforced in a variety of ways. They also need good access to the protected area, which is not typical of Tiritiri. The marine area contains several regionally significant geological features, including the shore platforms around Tiritiri Matangi Island and the cliffs and intertidal platforms around the Whangaparaoa Peninsula. These have been identified in the proposed Auckland Regional Plan: Coastal. Are these features in any way threatened by fishing? The marine area and adjacent land contain sites of cultural significance to a number of iwi. Other historic sites in the area include the wreck of the Royal Tar near Shearer Rock and sunken hulks off the Whangaparaoa Peninsula. Are these affected by fishing? The area is accessible to the public of Auckland, the North Shore and Rodney. Visitors from outside the region will also be welcome to enjoy the marine and land reserves. A marine reserve can be enjoyed only if the water is clear and the underwater life prolific and varied. This will never be the case in this area which is degrading year by year. Why are people not enjoying marine life at the much more accessible Long Bay marine reserve, also visited by many schools? Marine reserves are areas of the sea, seabed and foreshore where the marine habitat, plants and animals are preserved in a natural state for the scientific study of marine life. Marine reserves are open for the public to visit and enjoy. They provide opportunities for scientific study, education, recreation and conservation. Please note that such activities can perfectly be done outside marine reserves. Marine science does not need marine reserves, but it helps protect their experiments. What is the purpose of marine reserves? Please explain what is so distinctive, beautiful or unique about the marine environment in the proposed area? South of Okoromai Bay one finds what could be called the worst degraded area in the region, where the mud is so soft that no animals can live there. The only use scientists have made so far of marine reserves (other than Goat Island) is to try to prove that they are working. These kinds of studies are of no benefit to the public or for saving our seas. Worse still, many have been seriously flawed. It is a misdirected effort, stimulated by DoC funding. The Tiritiri marine environment is of little use for such studies because it is not representative of the rest of the coast around, located at the end of a peninsula, in swiftly flowing waters. There exists no other place like it. What can you do in a marine reserve? Marine reserves are open for the public to enjoy and study the marine environment. Activities that do not damage or disturb marine life are allowed in marine reserves. That includes boating, anchoring, picnicking, swimming, snorkelling, diving, and many other forms of recreation. Fine, we can already do these. What can’ t you do in a marine reserve? Generally, activities that damage or disturb the habitat and marine species are not allowed within marine reserves. Commercial fishing is prohibited, and usually recreational fishing and seafood gathering is as well. Don't mislead. Marine reserves are about NOT fishing (no-take). The Act spells this out. All fishermen and seafood gatherers will be excluded from the proposed area as they have been from all other marine reserves in New Zealand. They have to find other places, which is almost impossible since the proposed area takes away almost all their favourite fishing spots and sheltered waters. They are already excluded from a huge cable protection zone, adjacent to the proposed area. Many will need to go out much further, which constitutes an increased boating risk. Can fishers enter a marine reserve? People fishing outside a marine reserve can pass through a marine reserve with fish or fishing gear on board their boat, but can not catch fish within the reserve. Fishers are able to use boat ramps and other facilities inside marine reserves, provided that they comply with the rules of the reserve while they are in it. Although this theoretically so, there have been instances where fishermen have been harassed and brought to court by having fish on board, caught elsewhere. Fishermen are very uneasy about the way DoC has been handling this issue and about the proposed marine reserves bill, which places the onus of proof on the innocent. There are a number of iwi who have connections with Tiritiri Matangi Island and the Whangaparaoa Peninsula. Archaeological evidence shows Maori lived on Tiritiri Matangi Island by the 14th Century. Kawerau A Maki had a Kawerau pa on the island, and Ngati Paoa also had the smaller Papakura pa there. Ngai Tai and Ngati Maru have ancestral links to Tiritiri Matangi as well as other islands in the Hauraki Gulf. Hauraki iwi have links to Tiritiri Matangi Island and the Whangaparaoa Peninsula. Would they be better off with a reserve? Local Iwi defend their right to access for seafood, and are not in support of this proposal. The process for creating marine reserves is set out in the Department of Conservation's handbook for prospective applicants. The process is divided into two main parts, the initial non-statutory stage and the statutory stage. Before a formal application is made, the process is non-statutory. This stage involves site investigations and consultation. Once a formal application is made, the statutory stage begins, and this is carried out under the Marine Reserves Act 1971. The Act sets out requirements that must be met (for example public notification) and the time frames in which these must be completed. To read more about the formal and informal parts of the marine reserve creation process, visit this web page (process.htm). A very important point in this manual states that the proposal should be abandoned if overwhelming adverse public reaction is received. So your vote counts. Here is a one page submission form, or visit the web site of Option4 where you can submit your vote without the need of a postage stamp. This web site also makes a wealth of related documents about fishing and marine reserves available. At this stage we have not decided on boundaries for a formal marine reserve application. We want to ensure that everyone has a chance to have their say, and to do this we are presenting three options for discussion. These boundaries are based on the marine habitats and species as well as values and uses of the marine area. The boundaries follow straight lines, which is not typical of habitats. But the most important issue is that DoC should make one proposal and defend it on its merits. These ideas are not final, and we are now we are seeking the views of the public. This is your chance to comment on the proposal, and the boundary options presented here. You can tell us whether you support a marine reserve, which boundary you prefer, and if you wish, make alternative suggestions. On the basis of the feedback we receive and further consultation and scientific information about the area, a marine reserve boundary can be decided. Why does DoC rush ahead before adequate scientific studies have been done? 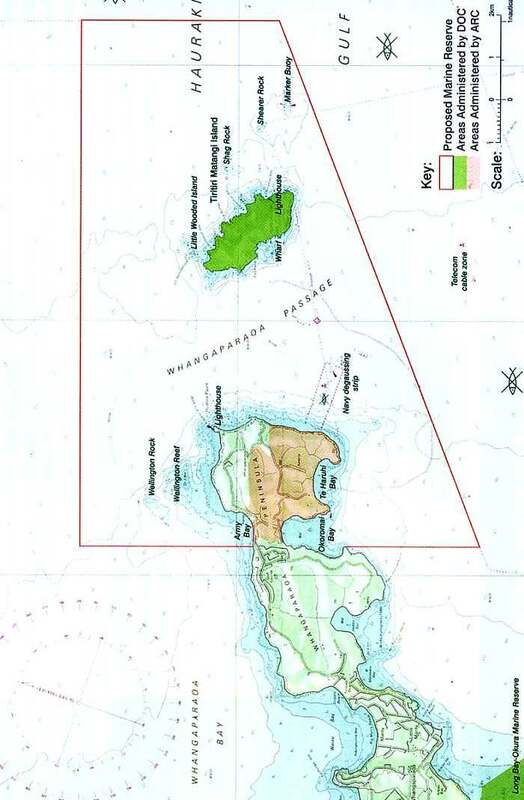 This would be the boundary included in a formal application for a marine reserve. The public has the opportunity to make a submission on the final boundary that is proposed, and the boundary may be adjusted by the Minister of Conservation in response to submissions. What is said here, is that the boundaries proposed by the majority of submissions are not binding. Indeed several marine reserves have been put in place in the past with boundaries not at all like those in the proposal. However, the eastern and southern boundaries are fixed by the large fishing exclusion zone, so skilfully left out of this proposal. On the map provided by us, note the huge pink cable exclusion zones which forbids anchoring and fishing. This zone is also more representative of the habitat on which commercial fish species depend. None of this habitat type has been protected in existing marine reserve, while it is more representative of the Hauraki Gulf. Neither has any scientific study been done in this area, not even to verify how 40-year old marine reserves work! If DoC wants to propose an area, it should allow people to vote for that proposal on the basis of its merits. What it is doing now, is fishing for support in whatever form. DoC should also clearly state the size of the proposed area. 1A. The northern coast of the Whangaparaoa Peninsula consists of extensive rock platforms. The geology is interesting with ridged and faulted layers of rock visible above and below the water. Large rock pools along the coast provide an opportunity for education and to study intertidal species. 1B. The largest rock pool is over 100m long! 2. Army Bay is a popular area for recreation and has a boat ramp. soft-sediment areas off Army Bay contain scallop and horse mussel beds. 3A. Wellington Rock is a popular fishing spot. 3B. Wellington Reef is good habitat for crayfish and reef fish such as snapper and red moki. There ae urchin barrens over part of this reef. 4. Hobbs Beach is a popular anchorage where people enjoy swimming, snorkelling and picnicking. 5. The Whangaparaoa Passage lies between the peninsula and Tiritiri Matangi Island. 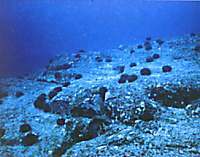 It contains a mixture of soft and shelly sediment areas, with extensive dog cockle beds. 6. The western side of the island has a mixture of rocky and soft-sediment habitats. In the soft sediment areas are scallop beds, eagle rays, flounder, stargazer, and other species. and scallops. Te Haruhi Point rocky with a mixture of seaweed forest and kina grazed areas. 9. On the end of Shakespear Point four ship hulks have been sunk to act as a breakwater. Some of the hulks, in particular the SS Wainui are still visible and create cavern and reef type habitat. The hulks have abundant seaweed and fish life, making them a good shallow dive 10. Okoromai Bay is a silty sand bay with a dense bed of sea grass (Zostera) and cockles. 11. Shakespear Regional Park is administered by the Auckland Regional Council. The park attracts many visitors and is important for education and recreation. The YMCA run a lodge in the park. Many people are annoyed that the brochure uses underwater photos that have not been taken inside the proposed area. It could be argued that this is done to mislead the public into believing that the proposed underwater environment is in a better state of health. DoC should use only photographs taken inside the proposed reserve, and guarantee in writing that this is the case for every photo shown. The urchin barrens myth has become a cornerstone in the promotion of marine reserves. It is believed that because snapper and crayfish have been fished down in numbers, the amount of predation on urchins is far below what is natural. Consequently their numbers have increased, with a corresponding decline in kelp forests which is part of their diet. The urchins bad, kelp good theory has spread far and world-wide. depletion of snapper and crayfish. This draft proposal for a marine reserve in the waters around Tiritiri Matangi Island and the Whangaparaoa Peninsula fits into a bigger picture of marine conservation. New Zealand is developing a network of marine protected areas both regionally and nationally to help conserve our biodiversity. As well as meeting the requirements of the Marine Reserves Act 1971, this proposal will also help achieve the goals of the Auckland Regional Policy Statement and the New Zealand Biodiversity Strategy. The network of protected areas has never been voted for, neither have New Zealanders been able to vote for the Biodiversity Strategy, which originated from a United Nations forum, dominated by ideological do-gooders. It has been a mistake of New Zealand to sign this convention, thereby foreclosing our sovereignty, tradition and right to find our own solutions to our own problems. The people working with the sea on a frequent basis are irate about this and will oppose any move made in the name of the Biodiversity Strategy which is flawed on all counts, see below. The Biodiversity Strategy as it applies to the land, is acceptable, but how it has been interpreted to apply to the sea is not. The sea is such a different place, that too few people have any idea how much. Please inform yourself by reading the biodiversity chapter and particularly how the sea differs. Biodiversity in short, is about preserving viable populations of all species, which does not mean that these should be pristine. Pristine populations do not exist in nature, particularly not in the sea where predation is the norm in many stages of the food chain. Fishing is just another form of predation, although it can easily be overdone. Fishing is not wrong per-sé but the quantity caught can be. In the sea it is perfectly possible to have healthy, functioning ecosystems that are being fished. Similarly, on land hunting is allowed in National Parks to keep wildlife in check. Because the kelp forests have not been burnt, the sea bottom not ploughed for crops, no grasslands planted for farming, no houses built or roads cut, the sea is still very much more pristine than any national park. With our Quota Management System, fishermen are gradually getting a grip on sustainable fishing, while also gradually minimising impacts on the environment. This plan has never been voted for, and it is hopelessly flawed. A marine reserve does nothing for biodiversity because the vast majority of species are not fished. Those that are migrant are the commercially interesting species, and these are not protected either. Only the very few resident species will be protected. The 10% stems from an invalid comparison with National Parks. Because we have 10% in land parks, we should have 10% in the sea, but as explained above, the sea is in a much better state than our national parks, even when fished! The main threats to our national parks, the rats, cats, stoats, goats, pigs, deer, possums still roam freely, threatening native flora and fauna. Likewise the main threat to the marine environment, landbased pollution will not be diminished by marine reserves or networks of these. The issues are more confusing because 'protected' in the international Biodiversity Strategy means where human actions have been controlled. In NZ protection means any form of partial protection, which includes cable ways, ammunition dumps, mataitai, taiapure and more. It is unpardonable that these areas have not been proposed first or investigated. The recent IUCN protected area classification confuses matters even more. Key players for this action are the Department of Conservation (identified as the lead government agency), the Ministry of Fisheries, Te Puni Kokiri, regional councils, iwi/hapu, fishing industry and non-government organisations. The Government web sites are extremely disappointing with respect to balanced education. Read the chapters on the Seafriends web site to inform yourself: www.seafriends.org.nz/issues/cons/. The Auckland Regional Policy Statement states that the Council “will support the establishment of marine protected areas as a method of sustainably managing Areas of Special Value within the coastal environment”, provided that the proposal meets a set of criteria outlined in the Policy Statement (ARPS 7.4.8 method 3). The flawed arguments for having marine reserves have crept into all levels of Government. This does not mean that they are right. We believe that a marine reserve around Tiritiri Matangi Island and the Whangaparaoa Peninsula would play an important part in a network of marine protected areas for the Auckland region and for New Zealand. Is this the view of the Council or that of the NZUA? Reader, please note that the whole marine reserves process is in a terrible mess, with misleading statements made by DoC and by marine scientists who should know better. The benefits of marine reserves have been highly exaggerated while their disadvantages and unsuccesses covered up. After many years of research into the benefits of marine reserves, these have still not been substantiated, and the benefits of networks eludes too. Read more about how the public has been deceived in www.seafriends.org.nz/issues/cons/faq.htm. Visit the war for marine reserves page www.seafriends.org.nz/issues/war/ for a sheer unbelievable litany of myths and misrepresentations. Worldwide of the 1300 marine protected areas over two out of three have failed, and this is the case too for New Zealand, where they have never been evaluated. Do we need more failed marine reserves? Even Goat Island is degrading! Marine reserves were first proposed for marine research, then for fisheries management, biodiversity, habitat protection and recently as an ecosystem management tool. Yet the best that marine reserves can achieve, is not any of these. The ten percent criterion is just a 'call for arms' or an 'ethical minimum', with other goals like 20% and higher waiting in the wings (Forest & Bird). What must the public think? Who is right? What are all these claims based on? We have a Marine Reserves Act which was a costly mistake because the existing Fisheries Act covered all that was necessary. Now a new marine reserves act, written to please DoC and to enlarge its empire, is before parliament even though it does nothing for the environment. To make matters worse, internationally the IUCN (World Conservation of Nature) has prescribed a recipe for Marine Protected Areas (MPAs), classified according to categories of protection. Yet our new legislation does not reflect these new trends. We have on the one hand Marine Protected Areas concept to which the 10% applies, yet on the other hand the ARC still wishing to achieve that 10% in full no-take protection. And all this is happening while the Government is in the process of creating an over-arching Oceans Policy. Obviously, the only sensible thing to do is to halt the entire process. Vote now to make your viewpoint known. Print this one page submission form.